One of my lovely customers Gail has sent through some great Golf Party food ideas. She held a a surprise golf themed 60th birthday party for her father-in-law – a Par 60 Surprise Birthday Golf Par-Tee! I love her creative names for the food and drinks. 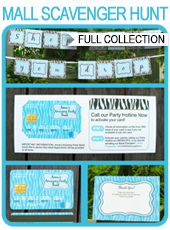 Gail used the food labels and signs from my Golf Party Printables collection to help decorate. I hope you find some Golf party food ideas for your golf par-tee!